This morning, I was cleaning out the spare bedroom and I thought I’d go through the pile of linens that were passed down to me by my maternal grandmom. When Grandpop was in the Navy, Grandmom sat and spent her hours of waiting doing needlework with her sisters. She made piles of dresser runners and tea towels, which I happily inherited. I’ve been thinking that I’d love to recreate some of Grandmom’s work- I think it would make my connection to my past even deeper. I chose a favorite dresser runner from the pile, and created some embroidery motifs from it. 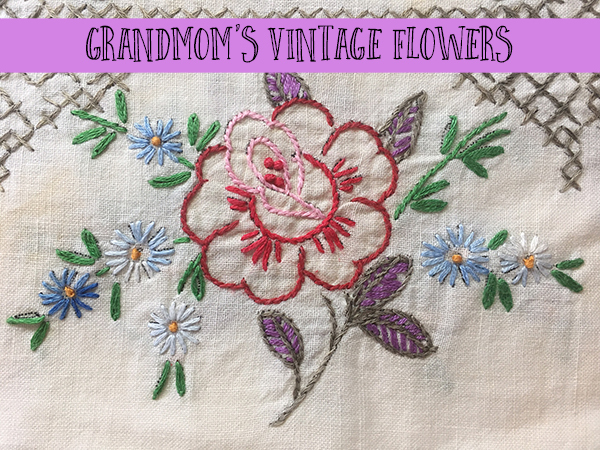 I’m looking forward to stitching up the same exact flowers that Grandmom did, over 70 years ago. It’s one of the things that I truly love about sewing – while Grandmom had to sew to make ends meet, now I get to sew simply for creative enjoyment, and the skills that she taught me still connect us – even though she’s been gone for several years. 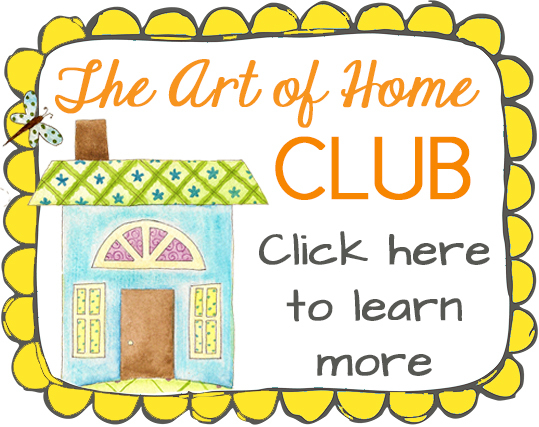 I decided to share these patterns in The Art of Home Club, they are truly sentimental and special to me! If you’re not a member of the Club yet, and would like to find out more, please click here. I’ve spent the week talking about all of the cool content and bonuses, so I won’t repeat all of that here in this newsletter. 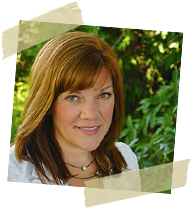 If you’d like to learn more and watch my video, please click here. Don’t forget that the Club will only be open to new members through Wednesday Nov 15 and then it will be closed to new members until around February or March of 2018. This article was posted in Embroidery, Featured, Sewing & Quilting, The Art of Home Club. Bookmark the permalink. Follow comments with the RSS feed for this post.Post a Comment or leave a trackback: Trackback URL. I was taught to sew by my Aunt, Christiana Evelyn, Auntie Chris to me. My Mum died when I was 7 and she helped my Dad to bring me up, I have her to thank for so many things and sewing is one of them. I learnt on a singer hand sewing machine to make my doll some cloths,that was many years ago and have continued to enjoy sewing ever since. My Grands were gone long before I was born, but my Mother always sewed and did handwork, as did my two much older sisters. Mama began teaching not to embroider before I started school, and to crochet b age 11…I have a few pieces, but my favorite is the pillowcase she was embroidering a few weeks before her death. I still have it in the hoops, with the needle and thread stuck in it…Have mounted it in a shadow box with her scissors. She passed away June 6, 1989, just before her 89th birthday…. You are so lucky to have some of her work! It breaks my heart when I go to yard sales and thrift stores and find these beautiful works of art for pennies! One yard sale I went to there was a whole box full of embroidered items crocheted doilies. The young woman I spoke to said “yeah, my great-grandma made these” and they were asking 5 cents apiece!! I bought the whole box full! I treasure memories of my grandmothers and my mother who passed along their passion for sewing to me. One of my grandmothers and my mother made most of my clothes growing up and my other grandmother quilted. I remember the quilting frame taking up almost all of a bedroom. I have several of her quilts. Each grandchild was given one special quilt and I also have some others. All are very special. Although not yet in my home, I inherited my mother’s old Singer sewing machine which is a cabinet model. I can’t wait to have it in my home. My other grandmother sewed using a treadle sewing machine. So many happy memories that I hope to pass along to my grandaughter! Thank you so much for the beautiful pattern! I can see your Grandfather in you. 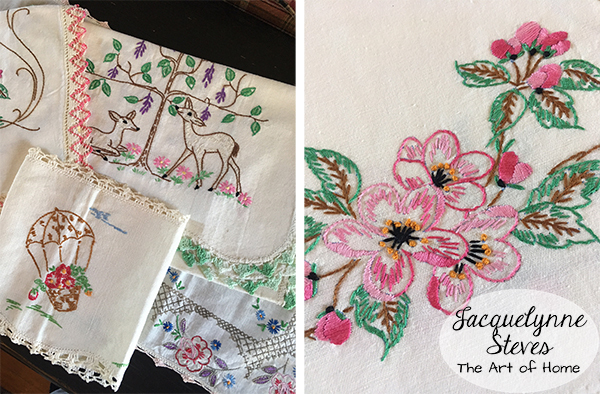 My story is…I loved watching my aunt embroidery and loved the old dresser scarves back then. I talked her into letting me try when I was about 8 years old. She taught me to embroider and I was hooked. I embroidered a lot of things back then but my favorite was a kitten in a basket of flowers. I no longer have any of the things I did and would love to find that pattern. Your Grandmother did beautiful work, Jacquelynne. I’m sure you got your talent from her. My grandmother taught me to sew on her Singer Featherweight. Grandpa bought her and my mom each a machine, table, only one set of attachments (thought they could share). My grandmother and I had all these plans for when I started 4-H the following summer. My grandmother passed away in February. But she was the one who got me going. I also have my grandmothers hand embroidered tablecloths, dresser scarves, pillowcases, etc. Also several appliqued quilts that she did all by hand. Cherished memories!! My maternal grandmother moved across country when i was 3,so I did not know her too much. She was very talented and we have a lot of her crocheted items,embroidery pieces and needlepoint. 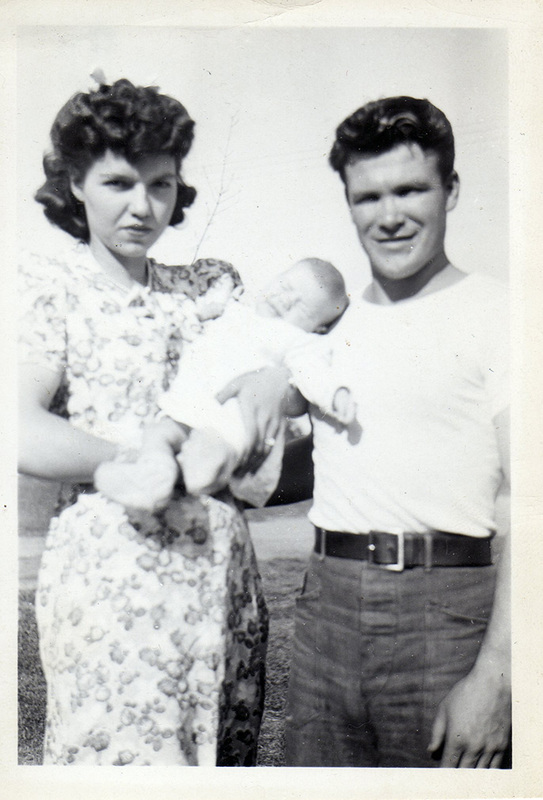 My paternal grandmother passed away before I was born. My paternal grandmother was an embroiderer. When she turned 80 she decided to make each of her granddaughters a dresser doily. It is the only linen I have which she made so it’s very special. My maternal grandmother was not a sewer or an embroiderer although she did make a hand sewn single bed hexagon quilt when she was still living in England over sixty years ago. Thankyou for sharing such beautiful memories and for the lovely pattern. My mother was never without a project going, be it knitting, crocheting, embroidering, stitching together simple quilts. I have the same as you, tons of embroidered dresser scarves and tablecloths, tea towels, my 27 windows are all adorned with her crocheted lace courtains, I have a box of crocheted edging she used for sheets among other things. I feel so lucky and privileged to have been her youngest of 6, each of us having more than one woolen blanked crocheted by her, and the lucky recipient of all these treasures. She taught me to crochet, a little knitting, we embroidered together until her passing at age 83, only two years older than my present age. I miss her tremendously even though it has been 25 years since her passing. Your embroidery samples are so familiar to me. Thank you so much for sharing. Your Grandmom left a treasure! Beautiful work and it thankfully landed in the hands of someone who appreciates it. Both of my grandmothers are my favorite people I have ever known though they have passed away. Unfortunately, I didn’t live close enough to them to learn the skills I was so eager to learn. I remember packages with handmade gifts from Arkansas. From that point it was going to be that I learned to crochet and sew one day. I met women over the years since about 15 years old who taught to crochet. Each of four taught me something new. I learned to embroider some from nuns while embellishing Christening gowns when I was seven. Another lady taught me more when I was in college. I learned to sew from a lady who quilts. One of my grandmothers knew how to do all of these things and was pleased with things I had made and sent to her. My other grandmother appreciated these things too. Her strengths were cooking and gardening. She taught me to cook. Thank you beautiful grandmothers! I was taught to embroider, knit, crochet and sew by my Aunt Marjorie. I have several of her embroidered pieces as well as some from other family members including my in-laws. I love using them and know I am doing the art that they all practiced. I have many items made by my Grandmother some I use every day like the antimacassars I have in my living room (Who knows what they are?) I also display linen guest towels in my bath room and runners on my dressers,I recently repaired a round embroidered center piece with hand crocheted lace edging, one colour was disintegrating and I was lucky to find a small piece of floss fairly close in colour and I discovered a small hole in the middle of the linen, so I covered it with a small doily (wine glass size) I had made for my trousseau 45 years ago. Antimacassars are coverings that are placed over the backs and arms of chairs and couches. I learned that on the Antique Roadshow program several years back and it’s stuck with me ever since. I have a quilt that was pieced by either my great grandmother or great great grandmother. My grandmother had it backed and tied sometime in the forties. The quilt is in rough shape, but I wouldn’t give it up for anything. My mother taught me how to embroider and knit. My grandmother taught me trapunto, helped me knit a multi-colored round pillow cover and I believe taught me how to hand sew. She always encouraged me to create and brought me crafty things to make. My paternal grandmother taught me how to crochet. I am so very glad I learned from these wonderful women. Crafting keeps me centered and sane. My mom was nearing 40 when I was born. I barely remember my grandparents. Mom taught me to sew, quilt and embroider. Like you I have some beautiful scarves, pillowcases and dish towels she embroidered. I have some out so I can remember her and I hope she would be proud of the work I’m doing. Thank you for these beautiful flowers. I have a book filled with vintage patterns and I always enjoy stitching them. My grand mother taught m how to crochet when I was 9 and taught me how to embroider when I was 15 or 16, she passed when I was 17. I still live crocheting but embroidery is my passion. That’s so wonderful you inherited all those Grandma Treasures and had the opportunity to learn from her. I’m sure she’s smiling down from heaven and is very, very proud of you. I didn’t had the opportunity to learn from my Grandmother, but apparently I have a natural talent for sewing, inherited from my Grandmother. She was known for her most amazing sewing and stitching and could sew like no one else. I have a couple pieces she made and treasure them lots. I do take patterns from them and make them with my fabrics as well as stitch ideas! My mom always tell’s me I inherited her moms sewing talent and I’m beyond thankful for that. Just loving to create and make people happy with my work. My Tante Lisl taught me to embroider when I was only 6 years old. She bought me little embroidery kits and supervised my needlework. That started me on my lifelong love affair with anything to do with needle and thread. I’m blessed to have a collection of beautiful table linens and other items embroidered by my Nana and my Tante Lisl that they brought with them from Germany in the early 1920’s. Yes, I use them, and love them, even with their stains and worn spots! My grandmother did lots of quilting, embroidery and she crocheted many blankets and doilies. I can still picture her with a tiny crochet hook and a ball of fine thread. She had 11 children and made many of their clothes, more out necessity than for artistic expression. My sisters and I love sewing, crafts, knitting, embroidery, and quilting and I think we inherited this from our grandmother. When my oldest daughter was born my grandmother gave her a handmade quilt that was made mostly from her old house dresses and my grandfather’s old shirts. Nothing went to waste! The quilting was done by hand and that quilt is so precious to me. Uncle Chet taught me how to sew by making pajamas for my doll, when I was almost 10. Been sewing ever since. It is such a great gift, as it has given me so much pleasure through the decades, especially when I sew for others. We were very poor so utilitarianism was a way of life for us also. You are taught the basics of home life at a very young age. I can remember my mother teaching me how to sew, knit and cook as early as 4 years old. Those are the memories that I cherish and hold dear, as I have taught all three of my children to sew, knit, embroider, cook and all things that are make. Nothing says love more than a handmade item. NOTHING! Thank you so much for reminding me of what is important as the holiday season is upon us and LOVE is what we need to share, like YOU are doing! THANK YOU! My Paternal Grandma (Mamaw) put my first needle in my hand to sew a button on my dads work shirt. I tried to thread it but that little hole eluded me so she put it in and made a long tail. She was ironing and I sat while we talked. As you probabaly guessed I sewed all of the thread into that button. He only comment was that button won’t come off again. My love of fabric and thread started and hasn’t ended yet. I only had one grandparent living when I was growing up. My paternal grandmother, Rose, like to crochet, knit, embroider and was a fantastic cook. At one time she worked in Doris Duke’s kitchen on her estate in NJ. I have a lot of her handiwork and cherish every piece of it. My mother was the person who taught my sister and me to sew as she made all our clothes when we were little. We even had our own little hand cranked sewing machine to make our dolls cloths on. What happy memories you sparked in all of us. Thank you Dear Heart…..
My mom use to hand embroider Christmas snowmen & Santa on a pretty white cotton printed fabric. She would always put them out on her end tables during the Christmas holiday. When she passed away I was lucky enough to get them handed down to me. So during the Christmas holiday I put them on my end tables. My Grandmother made a “Grandmother’s FLower Garden” quilt in the 1930’s. My Father remembered helping her work on it, cutting out the hexagons, etc. She used old aprons, pajamas, shirts, whatever she had to make the blocks. I was lucky enough to inherit this beautiful quilt! When I was having surgery a few years ago, I knew I’d be off my feet for several weeks so I decided a hand-sewing project would be a great idea. I’m still working on that same pattern and making a quilt like Grandma’s! I’m sure I’m much slower at it than she was, but I like to think she’d be happy to know that she inspired me. My mom taught me, my sister and a neighbor girl friend to sew in the 50’s. I was about 10, they were 12. Our first project was a skirt with sunflowers on it. What fun we had wearing our matching skirts! Mom also taught us how to hand embroider. Your vintage flowers are very similar to the ones we made. Mom also made doilies, but for some reason she did not teach us that skill. I’m sure she learned her sewing abilities from my grandmother. Your article has sparked a renewal of memories about both maternal and paternal grandmothers and their handwork. Several pieces of embroidery, crochet and quilts, some tattered and well worn and others in perfect condition, have been handed down through the years. I can hear my mother telling about her grandmother growing the cotton, picking, carding and spinning it to make a blanket that is now disintegrating but is full of memories. Thank you for your love of family and traditions passed down through generations. I was taught to hand sew by my late grandmother as a child which has given me my life long passion for hand stitching, my grandmother passed away when I was 7 and I held on dearly to all the little dolls dresses she had made for me. As I grew so did my skill with needle and thread and each stitch I take can bring me such fond memories perhaps its the reason I piece and quilt all my quilts by hand. Hi I have a dresser runner like the one with flowers on it . My mom did it a long time ago. She got a pat somewhere. I all that she didn’t finish but I don’t have the directions for colors. I will have to find it and finish it. That’s so cute! I do enjoy your posts!